What to know: The vitality of a lost sister can continue in the form of a good friend. Highly recommended. It's comforting to know that a loved one's spirit can live on. The vitality of a lost sister can continue in the form of a good friend. There can be a suitable substitute when you open your eyes and your heart. A young girl struggles with the death of her twin sister. She keeps seeing ghostly images of her dead sibling. 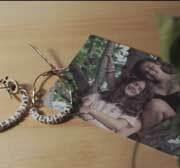 A friend offers her support and starts to fill in where the deceased sister left off. This non-narrative films tells a story through it's striking images that reveal the depth of emotion shared by these young people. I give kudos to the director of this film for excellent storytelling and to the actors who relay the story so convincingly. I have to admit that tears came to my eyes while watching the film. I really like the symbolism of the matching charm bracelets. It is very effective plot twist when the surviving sister places her beloved sibling's charm bracelet on her friend's wrist, in a moment of spiritual transition. It gives the film good continuity. Another powerful symbol is the sturdy tree where the sisters used to play. Their initials, carved into the tree trunk, are a classic cinematic representation of a forever bond. My favorite part is when the kids are in a classroom and the girlfriend places a clump of clay onto the surviving sister's nose, in a playful gesture to lift up her mood. A 14-year-old girl deals with the death of her twin sister.